I think it was about time we discovered a new reputable source of replica watches. I’m curious to see if ByShopOnlineuk.co.uk matches this description and this is why I am inviting you all to join me on this review of its replica watches and services. If you like simple online stores where you can easily find every single piece of information that interests you then you are definitely going to love ByShopOnline.co.uk. This website is the perfect definition of a basic Internet shop that focuses only on displaying its products and not on mesmerizing you with countless promotional banners and offers. The background is white, there are two menu bars- a black one on the top of the page and a white one in the left side- and there is also a medium size banner that displayed a couple of designer watches. Everything is plain and simple, friendly and easy to use. As I said earlier, on the top of the page there is a slim black color menu bar which shows only the most popular replica watches brands- Rolex, Breitling, Tag Heuer, Cartier and Omega. On the left side of the screen there is an incredible long list of watch company names that range from Rolex and Breitling to Wyler and Zenith. The collection is really wide and the offer available here is truly endless. Each brand includes hundreds or even thousands of different designs. Just the Rolex category includes over 5,000 replica watches. Luckily for us, each brand is organized into sub-categories and a very detailed Advanced Search is available on the page. We can sort the products by Gender, Strap Materials, Strap Colors, Dial Colors and Movement. All the prices of the replica watches displayed on ByShopOnlineuk.co.uk are in GBP. The company carries both Swiss and Japanese made knockoffs. The Swiss ones cost about 200 GBP-500 GBP and these are supposed to be equipped with a high quality 25 jewels Swiss ETA automatic movement while the Japanese fakes cost about 70 GBP-200 GBP and come with a 21 jewels Miyota automatic mechanism. At first impression, the pictures displayed on the website look very good. These have a nice clarity, are numerous and show the replica watches from all angles. But there is a problem with them. There always is one. These look like they were copied from three different catalogs and the name on them is different than the domain name. The watermark says LuxShop.su. This makes me think that the pictures weren’t taken in its own studio and that these do not show the actual products that are sold by the company. Also, the product description isn’t very coherent due to its broken English, but it is quite detailed and informative. ByShopOnlineUk.co.uk is able to process payments by credit card and the accepted card types are Visa and Mastercard. Western Union, Bank Wire or Money Gram isn’t an option here. Another concerning thing about paying on this site is the fact that the payment page isn’t secured by a security certificate. Usually, these types of pages should have https at the beginning. This means that when you are entering your card information on the page, any third party can highjack your details. I advise you to order only from websites that have the https payment processing page. The company can ship order all around the world free of charge. It does not ask for shipping fees no matter the number of replica watches you order or the weight of your package, which is really great. This allows you to save a lot on delivery costs. The site claims that the usual delivery time is about 3-5 business days and that two business days are required to prepare the dispatch of your order. The packages are shipped with EMS, FEDEX or DHL and a tracking number is provided. The website guarantees the satisfaction of your order with a 14 days return policy. This return policy covers any dissatisfaction regarding the replica watch and you can send the product back either for a refund or exchange. The knockoff must be in its original conditions, the customer needs to pay for all the return costs and a 20-40 GBP shipping and handling fee will be charged so they can process your return. But what I like most about the company is that they offer a 180 free repairs warranty for any manufacturing defects. I did not see a chat button on the website no matter how much I’ve searched for it. The only thing I did find on their Contact Us page was a Contact Form. The company does not provide any contact information like the address of their offices, an email address, phone number or live chat services. I recommend you to order from this website only after you send a message to Customer Service and you receive a friendly and polite answer from them. This will prove that they really are reliable. 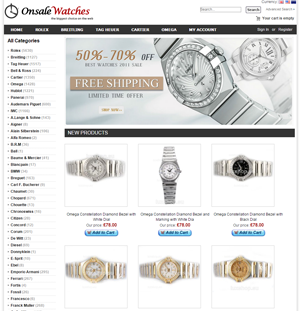 ByShopOnlineUk.co.uk is a very friendly looking fake watches website. Its design is simple, but it impresses with the large number of replicas it sells. Of course, the prices are also a source of amazement. These are very affordable and tempting. It seems to have everything you could want from such a store, including a 180 days free repairs warranty and free delivery. Unfortunately, there are things that make us question its liability and these are- the absence of decent customer services, the unfair return policy, pictures copied from multiple sources and not having a protected payment processing page. I ordered a watch from them a couple nights ago. I will let u know how it goes. I had about given up on buying a replica watch with all of the scams tht go on. This one was only $72 so I’m trying them out. If it proves to be an honest place I will be making the purchase I really want to make. I’m just testing the waters, as they say. I ordered a watch from this seller and said I would let u know if I recieved my watch or not. I DID receive it yesterday, about a week after I ordered it. The only problem I have with this site is tht I ordered a ladies (my fault) and want to return it for a mens. I emailed them and they got right back to me but the website is down, has been for almost two days now. Otherwise I would’ve given them five stars. Eitherway, I ordered the wrong watch so I’m not holding it against them. eagerly waiting to hear from you, if this site is trustworthy ,did they dispatch the watch? @Brad – did you receive the watch? Has anybody had any shopping problems with a Wrist Watch supplier called byshoponlineuk.co.uk I ordered a watch and paid for it and now they keep telling me that the watch is out of stock and i can reorder another. I did that and again I got another email saying that’s out of Stock as well and to chose another. I tried it and the site is either down or its been taken off.If you want a quality replica wrist watch use anoth site . Please share this complaint with your friends it will save then money. I now believe it could be based in China. Ive emailed them and im waiting again for a reply. So I placed my order on May 21st for 3 watches (brave/stupid, I know!) and today they finally arrived via DHL. As above I had emails saying one watch was out of stock and could I please choose another finally resulting in the shipment of my amended order. Communication by them has been poor, but at least they did communicate complete with an email telling me of the change to the website address. Shipping is from Hong Kong, unsurprisingly, and £16 more than the total on the website was taken from my account. This was communicated as a currency cost conversion which makes sense but they should tell you that. So, I’m happy I received my order and I’m happy with the quality as it matches watches a friend use to get me from China when he lived in Hong Kong. Would I use the site again? Probably. I received a watch I ordered it has only work for 2 minutes the second hand always stops at 11ock position. I have sent about 200 emails. I explained the problem and the emails that eventually came back did not resolve the problem. 2 months later I am still waiting for an address to send it back. They offered me 120% discount. I then told them I am happy to pay the extra for a swiss movement watch, still no answer. I usually judge a website by how fast their shipping is. One word describes this websites service…Horrible! From the time I ordered it to the time i received the watch took 3 weeks and I live in the U.S. They do respond to your emails but not in very good detail. The watch is amazing and works fine but if you have the patience to wait for it then by all means go for it. I found another site thats got faster shipping and better prices plus free shipping. Will never order another watch from this site again!